Click the map below for full size image. Save the image to your computer. Open image from your Download folder and click print. Hi, I am a subscriber but I cannot right click to save the image. Am i doing something wrong? Thanks! These maps are phenomenal! I’m trying to save them to my thumb drive to print later and it won’t let me. Have you changed the security settings on the pages? If I print the pages they are bigger than the page in landscape mode and thus split. in portrait mode they are smaller than I would like. Can you help? Just log in to your subscription to http://www.characterlocator.com and you’ll find them there. The small versions aren’t accurate, just placeholders. I’m not trying to be rude or disrespectful but I found two mistakes. White Rabbit is still on the map (I wish he were actually there) and there is an extra mickey hand at the castle stage. I hope I help you. Do you have maps for Disneyland as well? Hi Kenny! Making my TPs for April and I want to meet the Step Sisters. On the app it says they are at “*sir mickey” at the time I was thinking of finding them. Can you tell me where that is exactly? thanks so much! For this and all you do for us! Will Buzz still be meeting in January while the Buzz Lightyear Space Spin is closed? We were at Disney World last year for the first time with the kids. I made a shirt with all the princesses for my daughter (9) and or son (6) “girlfrind”. We had to meet all of the princesses. But the T-Shirt and our daughters look on her face, when she meet the princessses was worth it. Our daughter was a little shy, because we are from Germany and her english is not so good, so I did most of the talking. The princesses thought it was cute, that our daughter already has a “girlfrinds” and he is going to marry her ;-) For our son I bought a white “pencil case” (not sure if that’s the right description) for the characters to sign on. In addition I made him a shirt with Woody, Buzz and Jessie, because Toy Story is his favourite film and our daughter had a small white purse for the characters to sign. We bought Sharpie pens, which were recommended on a Disney forum, in Walmart, because they will stay on the fabric. Next time I plan to sew a pillow case for each of them. the longest wait we had for Jasmin and Aladin. we had to try 3 times. First time we went there at the end of the time mentioned and the line was closed, the second time we arrived five minutes after the meet and greet started and the line was already closed as well, the 3rd time I went to the line 30 minutes in advanced and was 2nd. in line. My husband took the kids to watch the parade and they joined me 5 minutes prior to it’s opening. If you want all of the princesses, be aware, that not all of them are in the MK, for example Pocahontas can only be meet at AK and Mulan at Epcot. Wonderful! I am definitely going to print this map. I’m wondering if anyone has been through this experience before, and can give me the best (quickest, most efficient) way to meet her list she has given me of princess. :) I will have my husband and son along, so stops at rides and “manlier’ things will be able to be stops. We will be using fast pass. I understand we get 3, and then after that, every time we want to set up a new one, we go to a kiosk. Or if there is a good time to meet some of them without the fast pass, depending on time of day and all that? Last year, our first time to take them, we did go meet Cinderella and Rapunzel, and before I had taken her to the Princess Beauty Salon they have their, and she was so cute. I noticed a lot of girls with souvenir books, dresses like the, etc. I’m thinking of having something made for her….but besides souvenir books, what do little girls like to take to meet the princesses? I had the pictures of the experience made into a book from shutter fly – it was wonderful. Even my grumpy old man (no REALLY) of a husband, it was his idea. it is really the most wonderful place on earth! thanks in advance! How often do you update the maps? Wondering if it’s accurate for our September trip. VERY accurate. Update every time a change happens. I love this whole site and I love these maps! I had one question on the master character locator there were some characters listed that don’t seem to be on the map – of course I could absolutely be reading something wrong :) for example I saw the witch from snow white in the locator after 7 – but didn’t see her on the map. Snow White witch is Mickey’s Not So Scary Halloween Party map only. Your maps are great – I have your character locator and it is helping me so much – I am going the last week in April. I had a quick question, on the master character list there were some that looked like they were in the evening only – the witch from snow white was one I saw, but she isn’t on the map – am I reading something wrong in the locator? Mickey’s Not So Scary Halloween Party is marked for her. Is there a list of when the characters will be at those locations? Good Work. This, of all your maps, is clearest when you put entrance at 6 o’clock position (bottom cementer). NOW all you need, above, is the word “ENTRANCE.” Never assume the viewer/reader/guests knows anything. Keep up the good work! 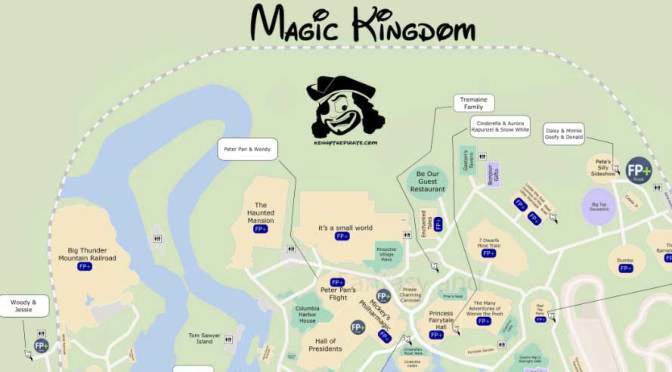 The font on the smaller locations on the Magic Kingdom map is so small that the compression has made the text impossible to read. Great work otherwise, these are some of the cleanest maps I’ve come across. No problem. I deleted the second of the two. Will you be updating this with Tinkerbell’s new location? Yup, when it happens. 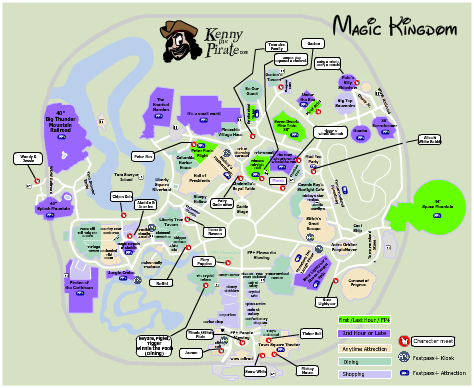 I updated Animal Kingdom map with Donald and Daisy yesterday. Marie tends to be in the front circle every time we have been there. Silly question. Is this printable? this is the only map that I can’t seem to print…it just displays like a messed up file….any suggestions? I just made the image you click smaller, try to click on it, then right click and print.